DANSURVEY is considered as an expert in Long Range RTK solutions. We have succesfully delivered positioning systems for the in-surveys on Horns Rev 2, Rødsan 2 & Kriegers Flak with an baseline on up to 50km. The DC-200 series Long Range RTK receivers are specifically designed to meet the most demanding requirements from the hydrographic and dredging industries. The new DC-200 series RTK receivers from AD Navigation provide real time positioning data at the 1 cm level while attaining the highest reliability and stability possible. Precise heading is optional to DC200 serie, giving heading accuracy better than 0.01 degree. DC-201 build into a cabinet for permanent installation. 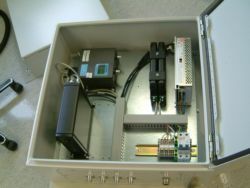 For temporary applications we can supply the DC201b in a weatherproof case. Broardcasting RTK corections via a 10w UHF modem are giving a range on 100km. Additional we can also supply the base station with GSM and Ethernet interface.